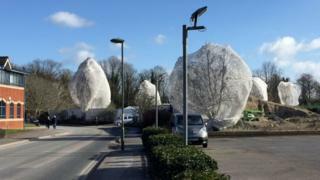 Wildlife experts are calling for stricter controls on nets installed over trees and hedgerows amid growing public concern about their use.People are reporting sightings on social media, while an e-petition has collected more than 190,000 signatures.Developers have said the nets, which are designed to stop birds nesting, are "standard practice" on greenery that might be damaged by building work.But the RSPB says they should only be used in exceptional circumstances.The wildlife charity has joined forces with the body that represents trained ecologists to call for new safeguards. "Netting is an overly simplistic approach that has become more prominent recently," says the RSPB and The Chartered Institute of Ecology and Environmental Management in a statement. "There is an understandable negative reaction from both the public and from professional ecologists to the real and potential harm that it may cause to wildlife." The use of netting can often be avoided with advice from a trained ecologist, they say. If there is no other option, it should be used only after planning permission has been granted. And the netting should be used in a way that will not trap wildlife and checked three times a day, they added.While it is an offence to destroy an active nest, there are currently no laws to prevent the installation of nets. According to Jeff Knott from the RSPB, the use of netting on hedges and trees seems to have "exploded" this year. "It seems to be popping up all over the place and that's been a real concern," he said. "The public interest in this issue has been absolutely huge. "Hedges and trees shrouded with netting are "a visual representation of how we are increasingly painting nature into a smaller, smaller box and how we are forcing it to fit in with our plans," he added. Campaigns on social media have led to nets being removed. Last week, residents in Berkshire, including nature writer Nicola Chester, used Twitter to report birds being trapped in a net on hedgerows in Theale. West Berkshire Council later said it would remove the netting.Meanwhile, a petition has been set up to try to make the practice illegal, arguing that developers and other interested parties are circumventing laws protecting birds, whose numbers are in sharp decline.And a crowdsourced map that allows people to post where they have seen the nets recorded sightings in Scotland, England and Wales, from Cornwall up to Glasgow.